DDA creates a state-of-the-art website on par with the effective and efficient services that the organization provides. Cardiovascular Consultants (CVC) is a network of cardiologists focused on providing the best care for their patients both in and out of the office. 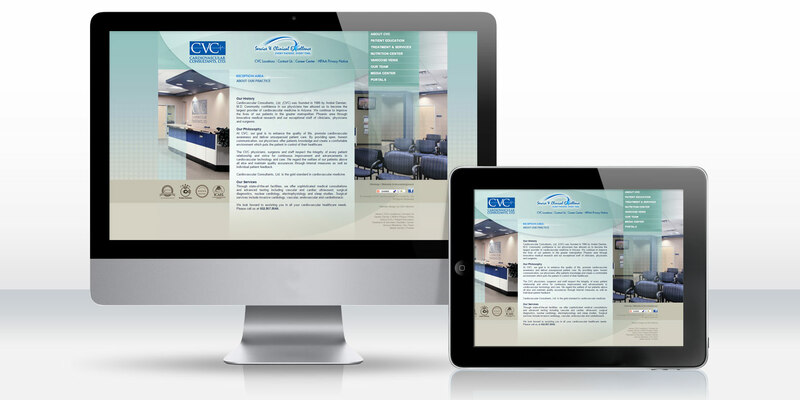 They were in need of an online destination to connect with both patients and physicians. CVC needed a website design and development company that could assist with search engine marketing as well as provide custom graphic design and programming services. The goal was to build a site that informed patients of CVC’s treatments and services and helped physicians connect with each other to refer patients and share information. The site not only needed to be attractive and easy to navigate, but there also needed to be interactive features programmed into the site to make it more than just a standard website. DDA Medical designed and developed this informational website for Cardiovascular Consultants (CVC) as a way for patients to find the information they need, and to help physicians provide the highest quality of care. This state-of-the-art website offers a wide-range of interactive reading materials and instructional videos geared towards informing visitors of the advanced services that CVC provides. DDA Medical programmed physician portals for facilitating patient referrals and secure physician-to-physician communications. There’s also a content management system (CMS) as part of the Our Team and News section where an administrator is able to add and remove doctors from the network and keep information up-to-date. An animated flip-book is integrated into the site to add interactivity to the information provided. DDA Medical has built a site that is both functional and scalable while still being user-friendly. The site is a true information destination, providing patients with important service and health information and physicians with a secure platform in which to communicate.